Manokwari: Although controversy is still raging about the Freedom Flotilla which has a number of Papuan activists on board, a group of Papuans who recently proclaimed the establishment of the Federal Republic of the State of West Papua (NRFPB) in Manokwari held a demonstration on 27 August. The demonstration which was organised by the NRFPB was highlighted by a number of Morning Star flags. The demonstration started from the office of DAP (Dewan Adat Papua – Papuan Customary Council) on Jalan Pahlawan and continued until 10am. In a speech at the demonstration, the deputy governor of NRFPB Markus Yenu called on all Papuans living in Manokwari to welcome the Freedom Flotilla which is sailing from Australia to West Papua. Security forces composed of members of the Indonesian police force mounted a strong guard round the demonstration. 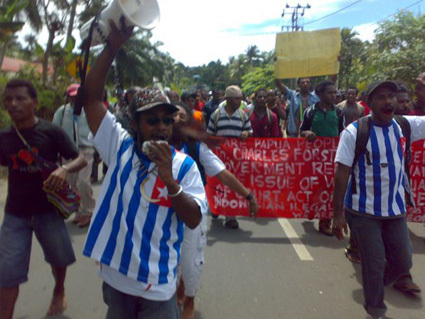 The demonstrators marched round the City of Manokwari distributing leaflets proclaiming freedom for the Papuan people. Morning Star flags were unfurled in several places but the security forces failed to take action. They just stood along the route without doing anything to confiscate the flags being carried by the demonstrators. As has previously been reported, the Freedom Flotilla with Papuans on board as well as Aboriginals (Australia) who have expressed deep concern about the situation in West Papua is now sailing towards Papua New Guinea. From there, the Flotilla will sail to Merauke, West Papua. The Flotilla is due to arrive in West Papua at the beginning of September.